We held our first event exclusively for our Loyalty Club members last week and have to say it was a resounding success. 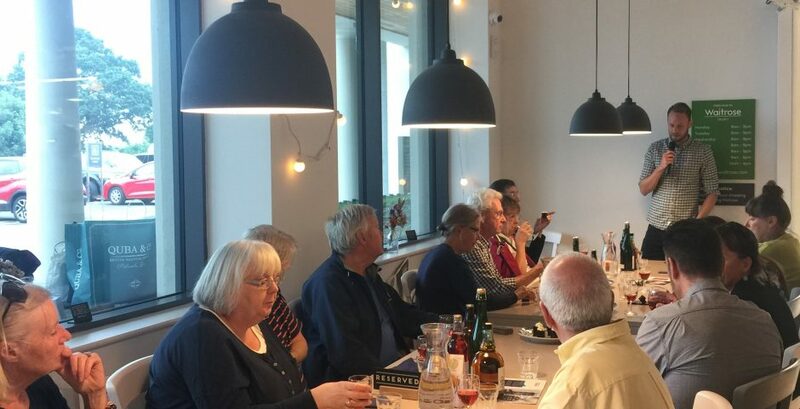 In the café we were joined by well-loved fine cider makers Cornish Orchards for a full hour of cider tastings. Chris Newton, head Cidermaker, fascinated us with the ins and outs of cider making and the different techniques that are involved in creating their diverse range of drinks. Loyalty Club members were treated to four different ciders expertly crafted by Cornish Orchards and the event was made extra special with an exclusive tasting of the newly released Westnorth Manor Cider, a dry, biscuity, bottle-fermented bubbly designed for special occasions. Each Cider was perfectly matched with exquisite dishes that our head chef Nik Tinney whipped up in the kitchen, all of which enhanced or changed the flavours of the different ciders being tasted. Our guests were surprised (and so were we to be honest) to find that Blush cider tasted sweeter with the chocolate stout cake we serve in our café and that the still Farmhouse cider (the one in the traditional flagon) was completely overpowered by the vintage, 3-year matured Davidstow Cheddar, but worked beautifully with the pungent Keltic Gold from Whalesborough Cheese based near Bude. After the event wrapped up, guests were handed goodie bags and many found themselves wandering over to our fridges to stock up on the foods and drinks they had tasted.